Do you love STAR WARS in equal measure too? Had you been awake, long night after long night, telling yourself that life would be complete only if someone, somewhere could find a way to mash both colossal franchises together? George Lucas was listening, you know. And when he has a night off to get his hair done, John Lasseter takes his place as the omnipresent one. It's STAR WARS done Cars -style. Sorry, I had to throw a little Lego lore in there too. Please ignore my fangirl simpering. You will never find these in a department store near you; they are (or were) available only at Disney Parks in celebration of their 2013 and 2014 and 2015 STAR WARS Weekend and only while supplies last... Made in China (like 95 per cent of regular Cars characters) but, unlike Cars characters made by Mattel, these are manufactured from different molds by another company. Obvious alterations aside, the dimensions and styling are subtly different with some characters and vastly with others. You will collect one each of every released character and package including the blister cards as well as boxed sets. 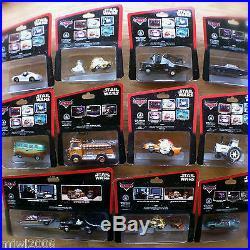 Disney PIXAR Cars STAR WARS Mater DARTH VADER & Doc OBI-WAN KENOBI diecast Parks. 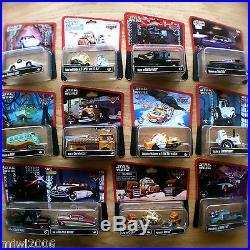 Disney PIXAR Cars STAR WARS Luigi as C-3PO & Pitties as JAWAS diecast Parks ONLY. Disney PIXAR Cars STAR WARS Red as CHEWBACCA NEW! 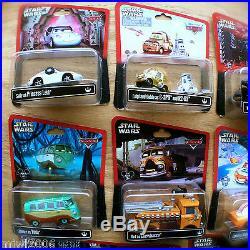 Disney PIXAR Cars STAR WARS Ramone as HAN SOLO NEW! 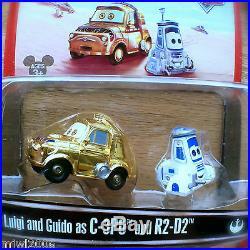 Disney PIXAR Cars STAR WARS Luigi and Guido as C-3PO AND R2-D2 diecast RARE. 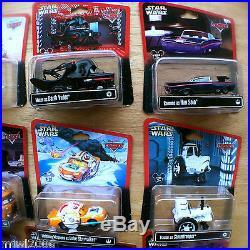 Disney PIXAR Cars STAR WARS Mater as DARTH VADER diecast RARE Disney Parks. Disney PIXAR Cars STAR WARS Fillmore as YODA diecast RARE Disney Parks exclusive. 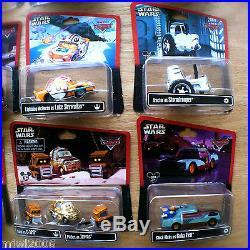 Disney PIXAR Cars STAR WARS Tractor as STORMTROOPER diecast RARE Disney Parks. 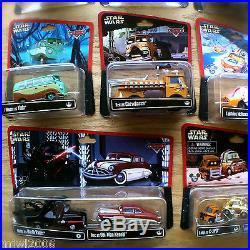 Disney PIXAR Cars STAR WARS Sally as PRINCESS LEIA diecast RARE Disney Parks. Disney PIXAR Cars STAR WARS Lightning McQueen as LUKE SKYWALKER diecast RARE. 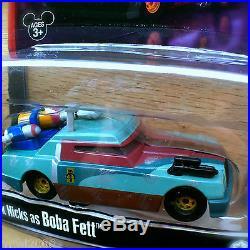 Disney PIXAR Cars STAR WARS Chick Hicks as BOBA FETT NEW! Disney PIXAR Cars STAR WARS TRACTORS as SANDTROOPERS. 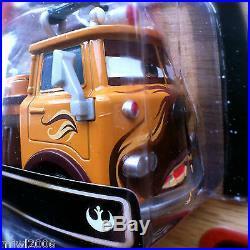 Disney PIXAR Cars STAR WARS THE KING as LANDO CALRISSIAN. Disney PIXAR Cars STAR WARS PITTY as BESPIN GUARD. Disney PIXAR Cars STAR WARS RAMONE as HAN SOLO IN CARBONITE. Disney PIXAR Cars STAR WARS LIGHTNING MCQUEEN as LUKE SKYWALKER (X-WING PILOT). Disney PIXAR Cars STAR WARS MATER as DARTH VADER (TIE INTERCEPTOR). 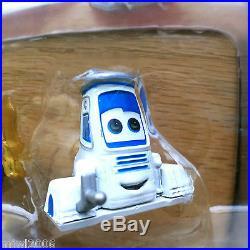 Disney PIXAR Cars STAR WARS SARGE as EMPEROR PALPATINE with CONE DROID. Disney PIXAR Cars STAR WARS LIGHTNING MCQUEEN as JEDI LUKE SKYWALKER (with Lightsaber). 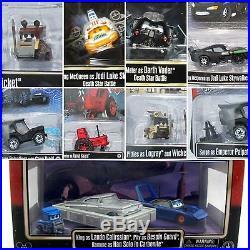 Disney PIXAR Cars STAR WARS TRACTOR as ROYAL GUARD, and. Disney PIXAR Cars STAR WARS PITTIES as LOGRAY and WICKET. 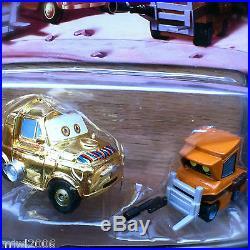 You'll notice that this assembled collection duplicated Mater as Darth Vader and Luigi as C-3PO. A duplicate Mater as DARTH VADER could be avoided by simply not including the single Mater but, with Luigi, he is either paired with Pitties as Jawas or Guido as R2D2 so you'll have two Luigies if you want both Guido and the Pitties. Again, with this particular collection, you are getting all 12 different available characters for a total of 15 diecast (two Darth Maters, two C-3PLuigis, two JawaPitties) within all 11 single- and two-pack/three-pack packages. You will also get another version of Darth Mater and two more versions of Lightning McQueens as Luke Skywalkers. Cards are in generally fair to good condition with the exception of the Sandtroopers boxed set which is in fair condition only with noticeable wear on the corners and front. Expect to find in all but three or four cases characters in packages that lat flat with mild wear along the outer edges which may or may not include noticeable bends along the upper corners. Bubbles may show mild to moderate wear as they travelled not from a perfect world, far far away. Please also note there were factory-seal adhesion issues with an earlier run on this series. I have been told that many bubbles were loose from the blister straight out of the case. Please examine the photos supplied for more detail on this complete set of these outstanding crossover characters. It the only complete set of 2013 2014 and 2015 characters available. If you are looking for single characters in this line, please check my other listings for availability. MATER as DARTH VADER; DOC as OBI-WAN KENOBI. CHICK HICKS as BOBA FETT; RED as CHEWBACCA, plus TRACTOR as STORMTROOPER; LUIGI and GUIDO as C-3PO and R2-D2. LUIGI as C-3PO & PITTIES as JAWAS. LIGHTNING MCQUEEN as LUKE SKYWALKER; FILLMORE as YODA, and SALLY as PRINCESS LEIA. But they are in limited supply. Characters as individual listings from 2015 coming soon! Welcome to your Canadian Prairie pit stop for Disney PIXAR Cars! McQueen and Mo Mater has the widest selection of Cars for online sale in Canada. We care for your Cars! Now featuring Planes, LEGO, Paw Patrol, Rescue Bots and more! Looking at a lot of stuff? And thank you for choosing McQueen and Mo Mater. Note that Canada Post Corporation counts acceptance as Day Zero. You will be glad you did. Cash on Collection available by appointment only. IT IS YOUR DUTY TO PAY DUTY. We source our merchandise from trusted, law-abiding collectors and suppliers dealing in legitimate, authorized products. McQueen and Mo Mater properly packages orders so that parcels arrive on doorsteps exactly how they left ours. And, finally, we communicate every step of the way so you always know exactly how long your order should take to arrive. McQueen and Mo Mater loves what we sell, we value our customers and stand behind our feedback. Considerable time and effort is invested into creating listings that work. Using Sell One Yourself from our listing? Please do not copy it word-for-word. If you do not see what you want, please ask. We are always happy to discuss custom bundles for buyers. The item "Disney PIXAR Cars STAR WARS COMPLETE SET ALL Theme Parks lot diecast 2013-2015" is in sale since Sunday, November 15, 2015. This item is in the category "Toys & Hobbies\TV & Movie Character Toys". The seller is "momcqueen" and is located in Winnipeg, Manitoba. This item can be shipped worldwide.